Does the “currency manipulator” hammer drop Monday? Earnings season remains a quarterly event… tariffs hit dollar store customers… reader flummoxed by failson… and more! The “oversold bounce” we anticipated yesterday has materialized today. As we write, the Dow is up about 200 points at 25,257. No, it doesn’t make up for the 1,300 points lost yesterday and the day before… but you have to start somewhere. The S&P 500’s bounce is even stronger — up over 1% to 2,760. And the Nasdaq is strongest of all, up nearly 2% at 7,470. In one sense, it’s a huge disappointment. Nine months into the year and the index is little higher than it was on New Year’s Day. And yet one of Wall Street’s savvier veterans anticipates a jump to the 3,000 level before year-end. As vice chairman of Blackstone’s wealth-management unit, Byron Wien is a thoroughly mainstream figure. But he’s made some prescient calls over the years… and he’s anything but a “perma-bull.” When he pipes up, we at least take notice. “I think we had to knock some of the complacency out of the market, and God knows, we are doing that right now,” he told CNBC yesterday as the sell-off still was in progress. Significantly, he says that rally to 3,000 will occur no matter the outcome of the congressional elections next month. Meanwhile, earnings season is underway and the banks didn’t disappoint. JPMorgan Chase and Citi beat profit estimates… and Wells Fargo delivered a noteworthy beat on sales. But Citi is the only one seeing a bump in the share price. 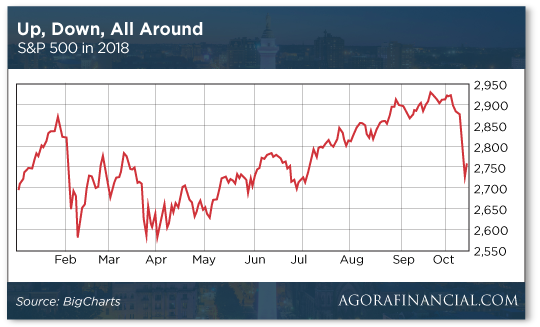 Everything happening today affirms the outlook of our own Alan Knuckman, which we’ve been sharing regularly for the last week: The 42-day window of earnings season that started today might very well be the last hurrah for a bull market that’s nearly 10 years old. Thus, it might also be your last opportunity for a few well-placed trades that could turn a small grubstake into a sizeable fortune. We’re talking about a nest egg that could make the difference between a getting-by retirement… and a retirement where maybe you wouldn’t have to worry about budgeting for travel or golf or meals out. This is a making-up-for-lost-time opportunity. Were you too scared to jump back into the market at the bottom in 2009? Have you spent too much of the last decade hiding out in cash or bond funds? That’s why Alan says now is the time to act. Play it right and you could quadruple your net worth. Here’s his strategy to play this final blowoff phase of the bull market. Now’s the time to act: With earnings season now underway, this offer comes off the table at midnight tonight. Speaking of earnings season: Apparently, it will continue to be an every-three-months thing. A few weeks ago the Trump administration floated a trial balloon about requiring companies to report every six months — supposedly at the behest of PepsiCo CEO Indra Nooyi. Stocks are jumping today in spite of a rise in Treasury yields. Most of the stock sell-off this month has been linked to rising yields. But today the 10-year yield is back to 3.17% and the 30-year is at 3.34%. Gold, meanwhile, is holding onto most of its big gain yesterday, the bid now $1,217. Crude is back above $71 a barrel again… but it’s still a big drop from levels earlier this week near $75. For the record: The Social Security cost-of-living adjustment in 2019 will be 2.8%. The Social Security Administration comes up with the figure this time of year, based on the government’s heavily gamed consumer price index. 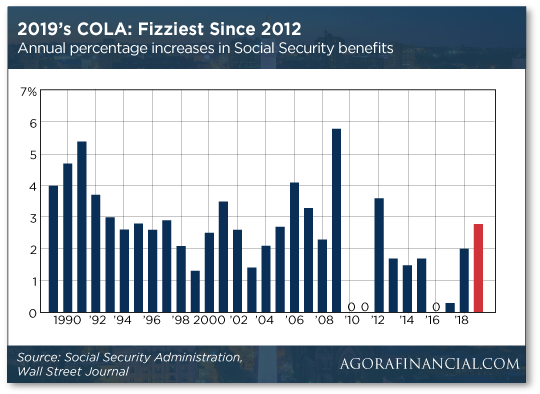 After a flat COLA in 2016 and a meager one in 2017… the 2019 increase will be the biggest in seven years. In addition, there’s good news if your Medicare premiums are taken out of your Social Security check: For once, you might still end up with a slight bump up in your monthly payment. The figures aren’t yet final, but the standard Medicare Part B premium for 2019 — that is, if your income is under $85,000 ($170,000 for couples) — will likely jump $1.50, to $135.50. That sounds pretty good… until you realize earlier this year, the White House and Congress demolished Medicare’s already-shaky finances. For another thing, Chinese export costs have dropped about 10%. That offsets nearly half the impact of 25% tariffs imposed by Washington. Surely the trade hawks in the White House are fuming. Monday is when the U.S. Treasury issues its semiannual report on Macroeconomic and Foreign Exchange Policies of Major Trading Partners of the United States. Yesterday a Treasury advisory board recommended against the manipulator label. But that’s only a recommendation. This is a situation Jim Rickards has been monitoring since July. If you’re a current subscriber to one of his publications, keep an eye on your inbox this weekend for an urgent update. Whew… The ban on plastic straws in Santa Barbara, California, will not carry the threat of jail time after all. As we noted over the summer, straws have become a trendy object of hatred — even though many of the anti-straw remedies are likely to do more harm than good. Earlier this year, Santa Barbara civic leaders proposed a ban on all food and beverage providers furnishing their customers with either plastic straws or stirrers. Repeat offenses would have been treated as a code violation — a criminal offense — carrying $1,000 in fines and up to six months in jail. The most vocal opponents of the bill are advocates for the disabled — mindful some people have difficulty drinking without a straw. “It is our concern that food and beverage providers will just simply stop buying straws, and will therefore not have them available for individuals with disabilities when requested,” says Dani Anderson from Santa Barbara’s Independent Living Resource Center. After one more vote to make the ban official, it will take effect next July. “Guys, I really am fed up with this comparison, not necessarily by you all, of tariffs and taxes,” a reader writes after yesterday’s episode. “I as a consumer have choices. However, what happens to me if I don’t pay my federal, state or local taxes? Yes — fines, interest or jail — à la Paul Manafort, right? “What happens to me if I choose not to pay tariffs, i.e., I deliberately do not buy a foreign-made product whose price has increased because of tariffs? Jail? Fines? Interest? The 5: Tell it to customers of the dollar stores. “The tariff will hit about 10% of Dollar Tree’s merchandise, or several thousand items, including household, health and beauty products, food, hardware and electronics, the company’s chief executive, Gary Philbin, said at a hearing before the U.S. trade representative in late August. Many of those goods are made only in China. According to the consultant Telsey Advisory Group, 42% of Dollar Tree’s goods are imported, as are 23% of Family Dollar’s. The overwhelming source of those imports is China. How we got to a point where certain goods are made only in China is a multifaceted question for another day. But please don’t make it sound as if consumers have a “choice” in the matter when tariffs are imposed — especially the most cash-strapped consumers for whom dollar stores are a lifeline. “I have looked for this word in two dictionaries and online. No luck! Please tell us what it means. The 5: Casual Googling indicates the word appears to have been coined a little over two years ago — by whom we do not know. Alan believes the bull market is still intact… but the six weeks of earnings season starting today might be your last opportunity to make hay before the market finally rolls over. If you feel as if you need to make up for lost time, Alan has the ideal strategy. Check it out for yourself here. Do so right away. With earnings season now underway, this link goes dead tonight at midnight.